Painting on the ceiling of Hiyoshi Shinto shrine. Yosano Akiko's husband wrote a poem about these three heroes who were to become the first war gods (kami) of the Showa era. Engineers of the 24th Kurume regiment, Eshita Takeji, Kitagawa Susumu* and Sakue Inosuke carried a ignited pipe made of bamboo containing 20 kilograms of explosive into the line of enemy fortifications, and died in the blast. The blast opened a path for the Japanese army to advance. The event was celebrated by Yosano's poem, Kabuki theatre, cinema and several songs. Three brave soldiers rice cakes" and biscuits were releases and the canteen of an Osaka department store offered Meat Bullet Three Brave warriors food (of unspecified ingredients). made heroes of the these soldiers over night. Some claim however that the incident was a mistake owing to the use of a too short, or incorrect fuse, and that soldiers expected to return unharmed but blew up. Other claim that the solders knew the odds that they were facing. As I heard when living in Kurume, it is also claimed that two of the three were from the Japanese underclass. While living in Kurume I heard the rumour from an ageing gentlemen that those from the Japanese underclass where the first to volunteer for such missions and the first to be asked. But that is only a rumour. Please see the following Japanese page for details. 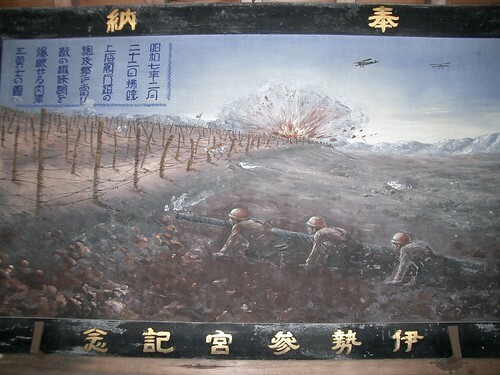 The tremendous popularity of this feat is dealt with in Censoring History: Citizenship and Memory in Japan, Germany and the United States where it is suggested, and I agree, that an examination of the media attention surrounding the "meat bullet brave men" allows us to understand just how fervent the war effort in China became. Some recent fiction portrays the Japanese as a land oppressed by militarists that forced the Japanese to participated in an unpopular war. Engineer Kitagawa's name might also be Tasuku, the character for his name can be can be read in more than one way.